I am not reviewing this as a reviewer for Metal Blade Records but merely as a fan, I have not been asked to review this by them, however I am doing it. There are many albums that come out within a year but there are few that get my attention like a new album from one of my favorite bands of all time like TYR do. This is quite honestly(for me)like getting an early Christmas gift having them release an album and what an album it is. The vocals on this album alone are fantastic but then there is the fantastic music as well. The video above has been played so many times by me and the album stream that Metal Blade Records had last weekend I played it over 10 times over the weekend. 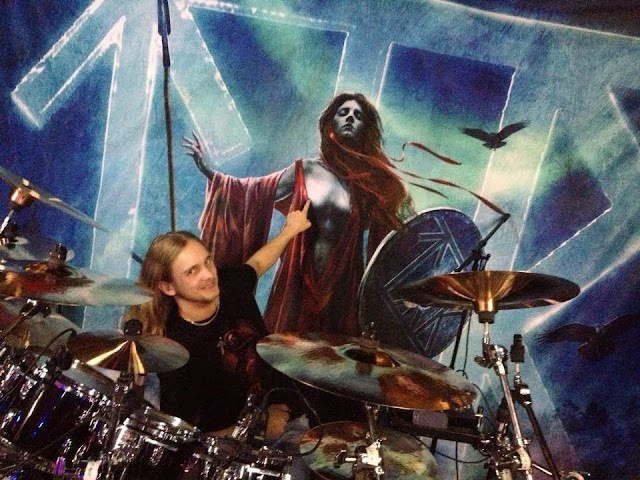 Amon Djurhuus Ellingsgaard is the NEW drummer for TYR as Kári Streymoy suffered an injury. Below is a statement from the band. We regret to inform you that Kári Streymoy and the rest of the band have parted ways. Kári suffered a back injury in 2008, and since then he has had some issues with his drumming. That is the main reason that the co-operation has been problematic for some time now, and we finally decided to part ways. We want to thank Kári for his time in the band. It's been great to have you with us, we wish you the best of luck in the future and we hope you recover fully some day. I do not have a favorite track on the album as this is just more incredible stuff from this band and they just keep getting better. The video is from their album "Land"
Their cover songs are awesome as are the bands that they are covering as well Iron Maiden and Pantera are gods in the Metal Community and when great musicians play their music it is just that much better-this is fantastic stuff, folks.